Place beef, fat side up, on rack in shallow roasting pan. Sprinkle all sides and underneath beef generously with garlic powder, dried onion, salt and pepper. Let beef stand at room temperature at least 20 minutes before roasting. Heat oven to 450ºF. Roast beef uncovered 15 minutes. Reduce oven temperature to 325ºF; continue to roast 1 hour to 1 hour 30 minutes or until meat thermometer inserted into centre of beef reads 135ºF (for medium). Temperature will rise about 5ºF to 10ºF after removing from oven; keep this in mind when considering cooking time and desired level of doneness. Let beef stand 15 to 20 minutes before slicing. Kitchen Tips: Roast should be at room temperature before roasting in the oven. Prepare the roast and allow it to sit in the pan with the seasoning on it for about 20 minutes or more before roasting. Tip: Do not add water or any liquid to the pan. Tip: Letting the roast rest after cooking before slicing allows it to retain its juices. 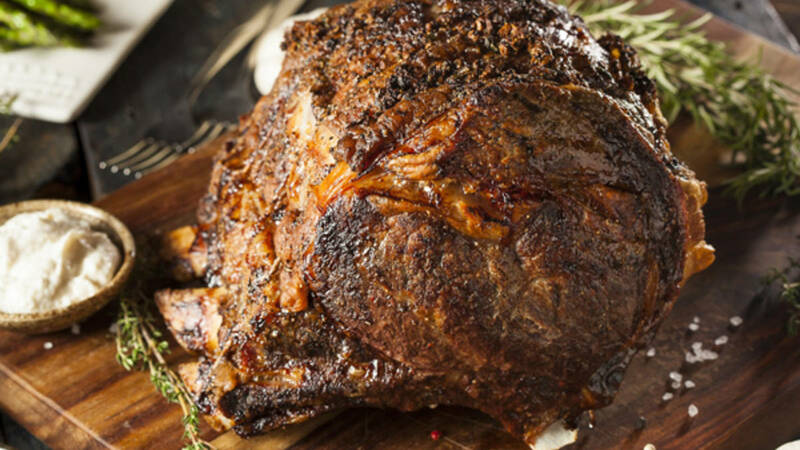 Tip: A bone-in roast may need a little more cooking time so be sure to check the internal temperature after 1 hour of roasting. Tip: An instant-read digital meat thermometer makes it easy to get a fast and accurate reading on the meat temperature.